Post a green ‘stache selfie to your Instagram story or feed. Tag #MatchaMustacheChallenge and @jadeleafmatcha. Tag 3 friends and challenge them to do it too. For each person that posts a Matcha Mustache (first post only), we'll be donating to FeedTheChildren.org — $1 if you post to your story, $3 if you post to your feed, up to $5,000. AND every Friday till the end of the year, we’ll pick one participant to win one of our brand new Matcha Ceremony Sets! See below for full rules. A mustache made of matcha, you say? Step 2: Add just a few drops of water, then stir with a spoon to make a thick paste. Step 3: Use your finger to paint on your matcha mustache - get creative! Step 4: Snap a selfie and post to Instagram! Tag #MatchaMustacheChallenge and @jadeleafmatcha. Don't forget to challenge 3 friends to do it too. ...and when you’re done, add hot water to the paste to make matcha tea, or hot milk for a tasty latte. Enjoy! We’ve got you covered. Our fresh single serve matcha stick packs just launched, and we’ll send you one stick for free. If you already *do* have matcha but decided to read this section anyway...we’ll still send you one. Because people that have matcha are cool. A wonderful non-profit organization called Feed The Children. We’re all incredibly lucky to have plenty of healthy food to eat…but many in the world don’t have this basic need met. Feed the Children provides clean water and healthy food to children and families all over the globe. Each $1 donated is effectively turned into $7 of food and essentials to those in need. For each person that posts a Matcha Mustache (first post only), we'll make a donation — $1 if you post to your story, $3 if you post to your feed, up to $5,000. So make sure to get your friends to post too so we can hit our goal! Did you say something about prizes? Oh yes we did. 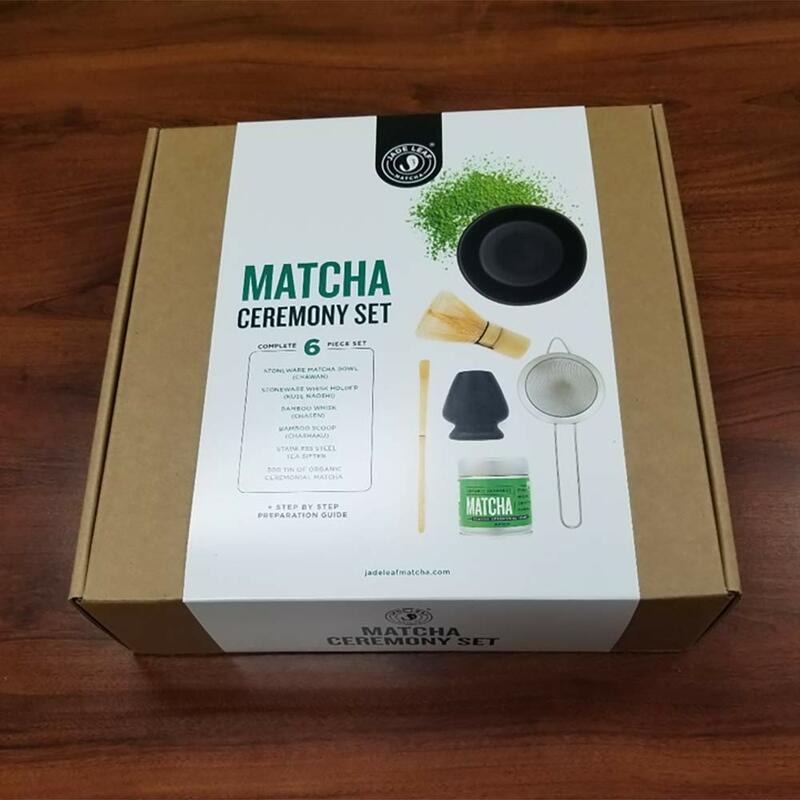 Every Friday through the end of this year, we'll pick one participant to win one of our brand new Matcha Ceremony Sets, just in time for the holidays. All of your entries will remain in the hat until the end of the year so you'll have multiple chances to win! Is this related to Movember? And we have answers - just email support@jadeleaf.com!